In a small Western town, spunky ex-city girl Lucky forms a tight bond with wild horse Spirit while having adventures with best pals Pru and Abigail. … Fun and friendship fly when former city girl Lucky teams up with wild horse Spirit in the heart of the Old West. Do you have a country loving kiddo who loves the Netflix series Spirit Riding Free and playing with horses? Then this Playmobil Lucky’s Happy Home set is the perfect gift for them! The set comes with Lucky and her beautiful county home that she shares with her Aunt Cora in the town of Miradero as well as Spirit, the wild mustang she bonds with and sets free after he’s captured by the wranglers. There is furniture and accessories for the kitchen as well as accessories for Spirit out in the yard. 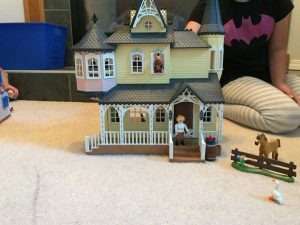 My 7 year old daughter wanted to build this all on her own and she managed build most of it – she just needed help clicking in some of the tighter pieces like the door and attaching the main parts of the house. 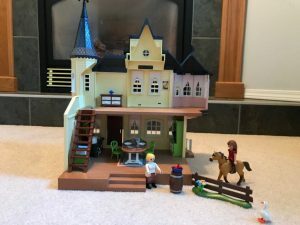 As usual, this Playmobil set is well manufactured with attention to detail and everything fit together nicely, the house is built tough so it doesn’t fall apart when the kids pick it up to move or play in it. One side is open so they don’t have to take off a roof or wall to get their hands inside to play. The kids have now added more horses, people, furniture from their other sets as all the Playmobil sets fit well together and they can’t wait to get home from school to continue on playing our all their stories. Lucky also meets two other girls, Pru and Abigail, who both own horses, Chica Linda, a palomino, and Boomerang, a pinto horse, respectively. They embark on everyday adventures across the land. Playmobil has sets for all Lucky’s friends and family that would make a great addition to Lucky’s Happy Home.